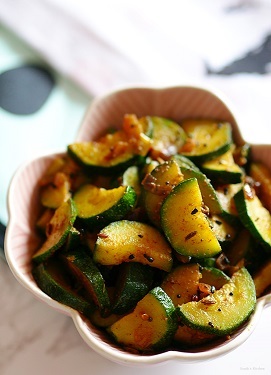 Zucchini makes a great side dish that is nutritious and low in carbs and is available all year round. A vegetable that is light on flavour, so you can spice it up as per your taste. I have prepared it with Indian flavours to give it that extra kick. The key to a good stir fry is not to over cook it, so don’t add any extra water and make it quickly, and you’ll get a wonderful tasting dish. Step 1 Heat oil in a pan, pop in mustard seeds, cumin seeds, fennel seeds, fenugreek seeds and dry red chillies. Let the mustard seeds splutter. Step 2 Add in chopped onion, saute for 3-4 minutes. Step 3 Add the ground spices and stir for a minute on low-medium flame. Step 4 Drop in the sliced zucchini and add salt to taste, give it a goods stir. Close the lid and cook till its done (about 10 minutes). Open the lid, stir well and saute for another 2 minutes.